Electronic Arts says the success of the iOS game Real Racing 3 means "the market has spoken" on free-to-play games. "Freemium" is another name for free-to-play games that you can download and play without cost, but can purchase optional upgrades for as you go. Mainstream gamers may not be terribly familiar with the term, as evidenced by the shocked and appalled reaction to the inclusion of microtransactions in Dead Space 3 (which, to be fair, is pretty far from free), but for mobile gamers it's as natural as the green grass and the blue sky. EA stirred up a fuss in February when it claimed that gamers are "enjoying and embracing" the microtransaction business model, but the success of the recently-released Real Racing 3 makes it a difficult position to deny. 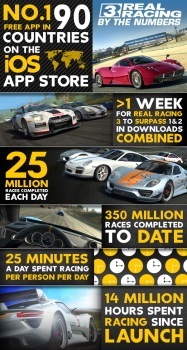 The game took heat immediately after release for excessively punishing non-payers but after some tweaks, it quickly became a hit; downloads during its first week of release exceeded the total combined downloads of the first two Real Racing games and Nick Earl, vice president of EA's mobile and social studios, said the decision to go free-to-play was "vindicated early" by its financial performance. "The vocal minority lashed out at freemium," Earl told CNet. "We respect them and understand, but the market has spoken. That's just where things are going." Earl's focus is obviously on mobile games, but it's not too much of a stretch to see how the principle can (and will) apply to mainstream, full-priced games as well. Like it or not, people spend money on these things, and that's what it's all about. Freemium content can also help extend the lifespan of a game by offering a stream of low-priced new content. "Our expectation is that this is a service that can live for years," Earl added, pointing the way to the future by referring to Real Racing 3 as a "service" and noting that developer FireMonkeys is hard at work on generating content for the game and has no plans for Real Racing 4.